I have had a chance to try a Lumia 900 (Best of Cnet CES 2012 Winner) from Nokia India, perhaps a flag ship device from Nokia. Instead of calling it a Review I just want to say it as the first Talk of Windows Phone OS 7.5 and the Design of Lumia 900 on TelecomTalk as I feel little embarrassed too to talk about WindowsPhone 7.5 when WindowsPhone 8 and Lumia 920 are out. So I will be discussing about the combined experience of Nokia Hardware on 900 and WindowsPhone OS 7.5 in this article. Nokia Lumia 900 is almost similar to Lumia 800 in design but it is bigger, feels massive and solid in hands. It’s one piece unique polycarbonate body prevents scratches and feels smooth in hands. 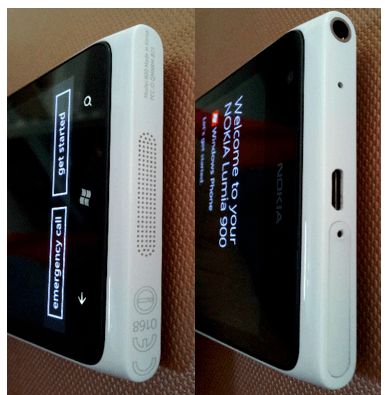 Available Colors of Lumia 900 are Black,White and Cyan.The speaker grill is at the bottom of the device, in fact a perfect place for speakers to give out best. The Micro SIM card slot and Micro USB port are situated on the top of the device along with 3.5mm Audio jack. Thanks to the open USB port, we can now insert and remove the cable comfortably for charging in daily use. The only design flaw I felt irritating is the SIM card slot which requires a pointed SIM Door key to remove it every time, of course normal users don’t find it irritating as they don’t remove the sim quite often. The Left side of the phone is kept clean without any ports or buttons while the right side of the device is equipped with silver colored Volume rockers , Power/Screen lock and two step Camera Keys. On the back you have 8 Megapixel Dual flash camera with usual Lumia Camera Design. At the Bottom of the screen there are 3 standard touch sensitive buttons for back, Home/Windows and Bing search. Overall design of the device is clean and curved without any odd looks of screws or panels. Lumia 900 boasts a 4.3″ AMOLED Clear Black Corning Gorilla Glass Capacitive Multi-touch Screen with resolution of 800 by 480 pixels and 16.7 Million Colors. The Ambient Light sensor controls the brightness of the screen and does it’s job perfect so that the screen is clearly visible even in bright day light. The display is crisp for watching movies, pictures and even reading text in any lightening conditions. I really loved the display. Lumia 900 has a 8 MP Carl Zeiss optics f /2.2 camera with dual LED flash and Auto Focus while the 1MP Wide aperture 720p front camera is used for video calling with applications like Tango or Skype but it can’t be used for native Network supported Video calling which is bit disappointing too. The wide aperture front camera gives high quality and comfortable video calling experience.Lumia 900 takes some decent shots and the performance of the camera is similar to that of Lumia 800. Unlike other competitive smart phones Lumia 900 runs on Qualcomm 1.4Ghz Single Core processor only and WindowsPhone 7.5 Operating System with 512MB internal Memory and 16GB Mass Memory. WindowsPhone Operating System runs very smooth and fast in every aspect in handling Applications and performing tasks. You can’t even notice a single lag in its performance. I can say butter smooth and a very fluid OS. This butter smooth performance proves WindowsPhone can perform very well and doesn’t require heavy Hardware Configurations like competitors. To those who are new to WindowsPhone and wondering how it looks like here is my small introduction to WP. 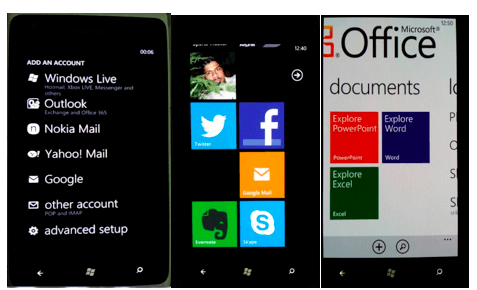 What WindowsPhone 7.5 User Interface Looks like ? You need a Microsoft Account to get started with WindowsPhone so that every service in the device works flawlessly and your phone details can be in sync with your account. For Nokia suite of services you also need a Nokia Account to enjoy your premium benefits. 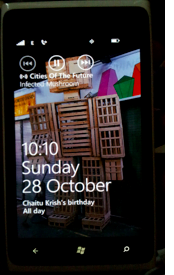 WindowsPhone 7.5 UI is mainly divided into two separate Screens, One is Live Tiles Home screen with small amount of space left on the right side of the screen for an arrow indicator and the other is Applications list or phone Menu screen. 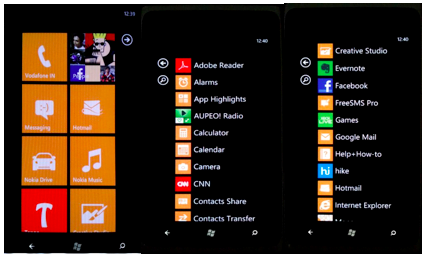 These two screens accomplish the only home screens of WindowsPhone 7.5 OS. You will have a back touch button below the screen which helps to go back and back within the applications which is limited, a Windows/home touch button which is used to go to live tiles screen from anywhere inside the OS and a bing search touch button together completes the three touch sensitive buttons below the screen. A long press on the back button will open a special window which displays a maximum of five of your last opened windows which can be used for a very limited multitasking. Social Media :For all the Social Media lovers, those who love to be updated or update their social presence there is a dedicated Hub and tile called People Hub. You can add all your social accounts and start enjoying the hub which is a complete package for social media in Windowsphone. You can even chat with your Social friends from the native Messaging application once if your social accounts are configured and set status as Online. Definitely a great Social Package for social Media lovers. Coming to the UI again the Network Strength,Connectivity,Battery,Call divert,Vibrate indicators – notification line just vanishes after few seconds and if you want to check them back just a small wipe on the screen from the top makes them fall back on the screen again. This is a very interesting feature as well as a bit irritating because we need to wipe the screen down every time we need to check the signal status or battery indicator but it keeps the screen clean from occupying space. Lock Screen: Lock screen is very attractive and in fact gives a novel look to the screen. With the “Now playing information” always on the top and the display of Time,Date,Notifications and Calendar events on the lock screen gives a great feel and comfort to the user. Though WindowsPhone is a new platform it has managed to get most of the famous applications available on other platforms. Lumia Range of devices come installed with rich package of Nokia essence apps like Maps,Navigation,Creative Studio,City Lens, Mix Radio ( A must try application which plays random tracks from Nokia Music servers which choice of different languages and Genres) and many of such rich content apps out of the box along with Microsoft Office suite of applications. Most of the good apps are developed and supported by Nokia itself, so you can rest assured of some decent quality apps on the platform. Without the special mention of awesomeness of inbuilt email and calendar app I feel that the app talk will not be complete. Just experience these Apps and you will know why I made a special mention of these. • Excellent on screen Keypad layout ,availability of wide range of emotion icons and flawless predictive input. 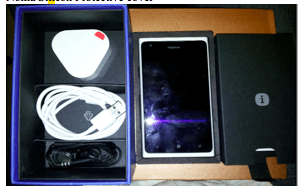 • WindowsPhone OS 7.5 has some basic issues and to mention – some features like Cell Info Reception,USSD Support are missing while the notification system still have to be improved. 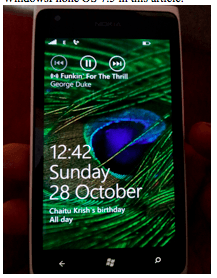 • No Blue-tooth File transfer as of now but Nokia promises an update to support Blue-tooth file transfer to Lumia Range of Devices soon. What the Sales Box Contains? SIM Door Key, Product leaflet and startup guide. If you are a normal user who loves simplicity,hassle free and ease of use without any exploration of the device – Windows Phone does it for you. It’s very simple,graphical and fluid UI is eye catchy all the time and Lumia 900 hardware does it without any glitches. Do you own a WP device or planning to get one ? Let us know your experiences. nice data and informative text . both I like and feels user friendly . Nokia has music and city lens which gives more value to it. all games and application are coming in free category for MS marketplace . feels nice to back on Win platform , which gives office mail integration and outlook. also LYNC is available to use all the time.